Fluval external canister filter, internal air driven sponge filter. I have previously kept a 50 liter tank and decided to move to a 100 liter about 6 months ago. I quarantined all fish for 6 weeks and tank was cycled from the start as I used media from old tank. I've looked them all up but none of them really fit. Because of this I did not medicate as it seemed like I was firing in the dark. If you have any advice or just a hunch as to what it could be I would really appreciate it. 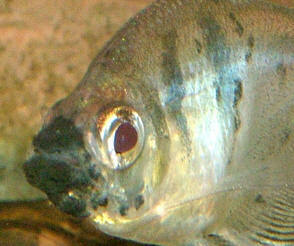 The worst thing is that it doesn't really fit any one disease That are common to neon tetra. Could I just ask you, if it is Neon Tetra Disease, can it infect my other fish, being cherry barb, emperor and phantom tetra? Also, I assumed it was a very fast acting disease, killing the fish quickly, so in my case can the disease be chronic, and take over a month to kill the fish? Season's Greetings and best wishes for a happy 2017. Thanks for the awesome job you keep doing. microscope so cannot sample a tissue scrape. High nitrates >40 ppm, pH 6.5, TDS 180 ish, 30 percent water change weekly. Fed Hikari Micro Pellets, Tetra pellets, Ocean Nutrition Spirulina and brine shrimp flakes, NLS Thera A and occasionally freeze dried blood and Tubifex worms. Tank has had episodes of what was diagnosed as NTD in Neons and Black Neons and affected fishes euthanized as per your suggestion. Should mention that I add 4 ml 2 percent Glutaraldehyde daily to augment CO2. Any input will be most be most helpful. Thanks for the super fast and clarifying reply. I'll let things be, but keep a watchful eye - my favourite approach to the hobby. I initially had three rosy's, but one became stuck between a rock and the tank wall and died. I can only guess he had grown too large because he frequently swam through the rock formations in the tank. Because of this, I thought it best to rearrange the tank. I put the fish in a large plastic washbasin with an airstone and the heater while I tended to the tank. Parameters before and after have been consistent. Ammonia 0, nitrates 10-20, nitrites 0, GH 75, KH ~100, pH 7.6 . Anyhow, after returning home and settling down, one diamond started to list a tad. He seemed to swim ok, but whenever he swims fast, he spirals. After some Google -itis on my part, I worried he may have whirling disease and put him into quarantine that night. He did fine in quarantine.... I treated him with extra stress coat and wee bit of Melafix. He did well and stopped spiraling. So back home he goes and he promptly starts to spiral again. However, he schools with the other diamond (and sometimes the barbs shoal with them it's funny to see them plop down into formation. ) He eats well, he doesn't appear ill, he just lists a wee bit and spirals. He doesn't spiral during "normal" swimming, just when he "power" swims. 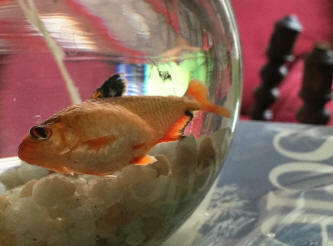 Now I'm wondering if he has a swim bladder dysfunction. Since stress apparently makes it worse, I'm reluctant to move him anymore. Should I try to treat him again? If so, with what? I'm of a mind to just let him be, keep up water changes per usual (20-50% every 1-2 wks), and see how he does. I don't think he was comfortable in quarantine as a solitary fish. I have searched your FAQs and other pages but cannot find an exact match for the problem. descriptions speak to very distended stomachs and bulging - this fish is large all over. <Are you sure he's a Neon? 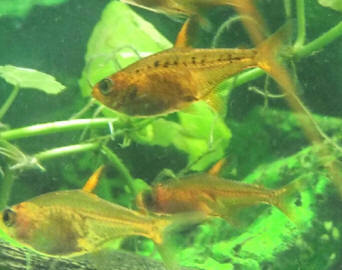 Cardinal tetras are similar but a bit bigger all around. Conversely, Paracheirodon simulans, the so-called Green Neon, is somewhat more slender than the Common Neon Tetra, Paracheirodon innesi. My question is does dropsy sometimes produce this overall swelling? Could it be some sort of water exchange/retention issue? What would you recommend as a treatment? Hoping someone can shed some light on a problem I'm having with one of my Black Phantom Tetras. I'm afraid I'm losing him. I noticed a few days ago he was hiding underneath a plant and wouldn't come out when I was feeding them. He seems to be resting at first glance, but his black markings are fading and his top fin is a little more limp than the other fish. I haven't seen him eat in a few days. He seems to be able to swim fine if he is swimming along the bottom, though I've only seen him swim a few inches at a time, and not frequently. About an hour ago I was watching him. He had emerged out from hiding and was at the bottom, in the middle of the tank. He suddenly took off like a shot upwards - I thought he was going after some food. But instead of swimming in a straight line, his body was rolling and tumbling at top speed as he swam upwards. It happened so fast that I couldn't really tell quite what his body was doing. He is now back at his resting spot under the plant. When he is resting his body appears normal, no "u' shape, bloating, or moving in circles or going upside down. Any idea what could be wrong? I was concerned about whirling but I've never fed live food, and his back half is not darker, in fact it is lighter since he's lost much of his black markings. I see no lesions or anything else odd about him. All other fish appear fine. I do have a 10 gallon quarantine tank though it is not set up...should I transfer some water from the larger tank so it will be cycled, and then transfer him into that tank? Is there anything I can do to help him? I've been reading up on Whirling, and I saw that it can be caused by eating a dead fish (?). Just wanted to mention that I lost a fish last week, and suspect that it had been dead a couple of days before I found it (I usually do a daily head count but didn't for a couple of days). It looked like the fins had been nibbled. 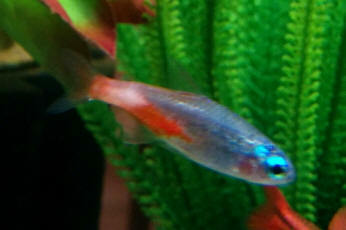 This was one of my red phantom tetras. Approx. 8 months ago it developed a tiny black dot inside it's body and over the last many months this growth has slowly spread. Right up until the end he was schooling and eating and energetic, but I guess the growth/disease took its toll. He did not show any symptoms that the black phantom is showing. Just thought I would mention that, in case it was relevant. Also, in doing further reading, I came across Neon Tetra Disease, and False Neon Tetra Disease. Does the black phantom's condition sound like either of these, and if so, can you explain the difference? I also read that one of the first symptoms is whitish patches, which I don't see in my fish. This morning I saw a new symptom...periodically the fish is in a vertical position, with nose to the gravel and tail skyward. He is not doing well at all. Could you please expand on your note below - if it is Sporozoan/Microsporidean as you suggest it could be below, what do I do? I assume he should be quarantined. Is there any medication that can help? Note that I haven't seen any black shiny dots on him at all, he is very pale and his formerly black markings are now very light grey. Is Sporozoan/Microsporidean the same as Neon Tetra disease? Should I be concerned for my other tetras? If you could provide more info, or direct me to a link, that would be most helpful.